Whenever I find myself in a new town, I always look up a Triple-D restaurant. Why not? The places always have rave reviews and you know you are going to get a BIG, hearty meal. 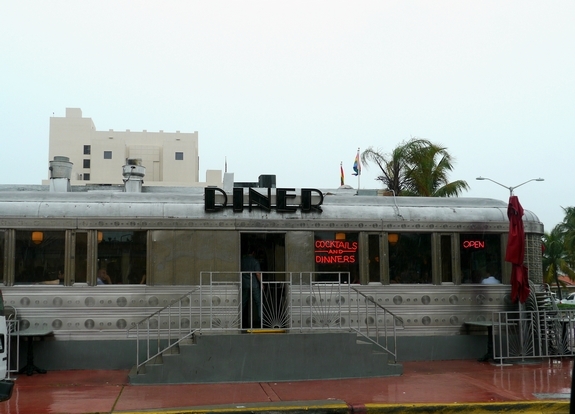 Finding myself in South Florida this week, we had to give 11th Street Diner a try. We showed up at lunch time on a busy Sunday, brunch was in full swing. If you’ve ever been to Miami (South) Beach, you would also know parking is scarce. All the little bars on the main drag offer valet parking for a cool $30+ bucks just to go in and sip a drink. Luckily, the diner is about a block or so off the highway but parking is still an issue. With that being said, I don’t know how we managed to pull up and park right across the street and score a table for four in about five minutes. The place was PACKED and it looked like everyone was really enjoying their food. You could tell this was a neighborhood and tourist favorite. Kitsch was everywhere inside, lots of things to look at…murals, celebrity photos who had been there…and the people watching was not bad. Overall, very interesting. You could definitely go there by yourself and be entertained. Lots of folks were also enjoying cocktails, not sure if it’s because it was a brunch thing or if was a normal weekend activity there, but people were having fun. We of course ordered the three dishes from the menu that Triple D featured in their show…we had to right? 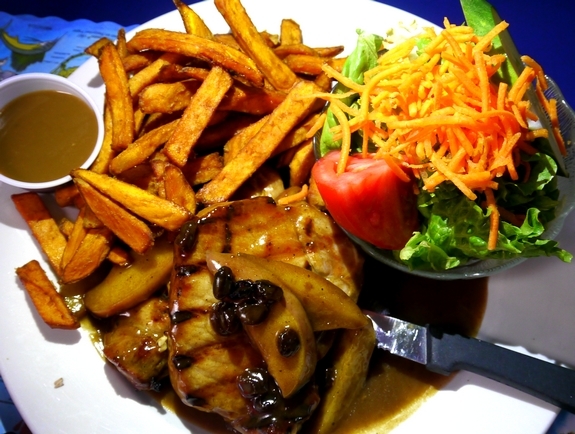 I had the pork chops with an apple and raisin sauce. It was delicious. The sauteed apples and raisins had been plumped to perfection and served in a gravy-pan sauce. It was decadent and full of flavor. The chops were cooked perfectly. I had a side salad and sweet potato fries to accompany the chops. I could not finish…all the portions are huge! My only complaint, I had an iced tea that tasted like water. Whoever made it that day forgot to add another 8 or 10 tea bags to their brew. My son had the turkey dinner…it’s more than you would eat on Thanksgiving. 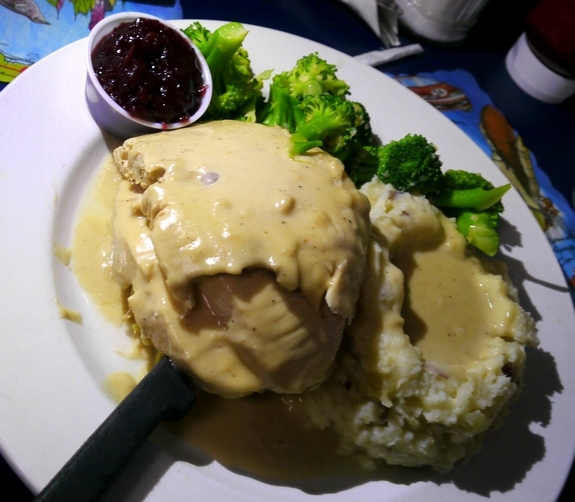 The sliced turkey is served over some amazing stuffing all smothered with down-home gravy and mashed potatoes with cranberry sauce on the side. He chose broccoli as his side dish and let me just say…sauteed in butter and garlic, it was perfection. He also ordered a Strawberry-Banana Shake, which he loved and drank before his meal was served. No wonder he couldn’t finish! Kids. My husband had the Argentinean Skirt Steak served with a tomato garlic relish. He asked for medium but it was definitely prepared medium-well. 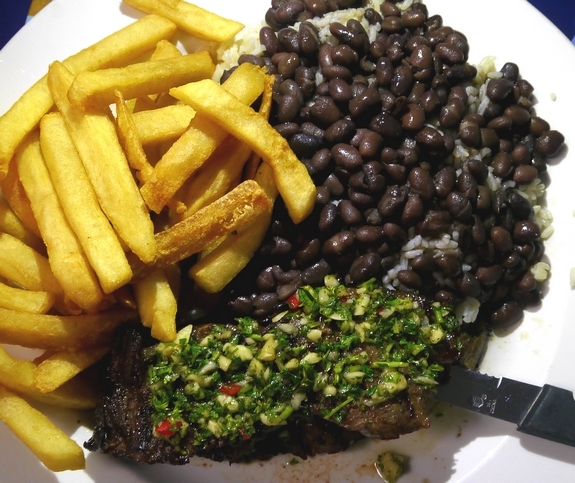 However, it was still excellent served with some very flavorful black beans and rice and French fries. Overall our meal was fantastic, no real complaints, other than we stuffed ourselves (our issue). Again, the place was packed and we still had good service. I always check the bathroom at a restaurant and to my surprise, it was very clean and well kept. I am very picky when it comes to “bathroom cleanliness” and I was amazed a place this busy could keep it up. Bravo to them. I would definitely recommend giving this place a try if you find yourself in South Florida. « Florida Travel: We Have Escaped…. I love triple-D and I have gotten into the habit of checking out the Food Network site when I am heading somewhere to see if there might be something I want to try out. Mega yum, everything looks so good! That’s a great method for finding great places to eat; I am going to try that. We have a Triple-D place nearby called Eveready Diner. I was so excited to visit the first time after seeing it on TV, lol. I’ve always wanted to go to a Triple-D restaurant! I bet it was wonderful! I need to start looking them up! Fantastic photos, and interesting looking eats! I just love sweet potato fries. Thanks for the recommendation! It seems pretty kid-friendly too!